Blockbook. Woodblock print on paper. 214 x 143 mm. 8 leaves, printed on both sides of the sheets. With 14 illustrations and text, all in woodcut. First edition, second issue. ‘The seven planets and their children’ is a fine example of medieval popular astrology, with an emphasis on the influence of the planets on humans and their conditions. Blockbooks are characterized by a close relationship between images and explanatory texts, as both were cut and printed from the same wooden block. This blockbook describes the ‘seven planets’ known in the Middle Ages: Saturn, Jupiter, Mars, the Sun, Venus, Mercury, and the Moon. Each planet is shown on the recto of a leaf, symbolised by a man or woman, along with two zodiacal signs (houses), and twelve lines of text above. The versos feature pictures of the ‘children’ in lively scenes with their human activities influenced by the planet in question, such as agriculture, hunting, fighting, commerce, music, praying, artistic occupations, etc. 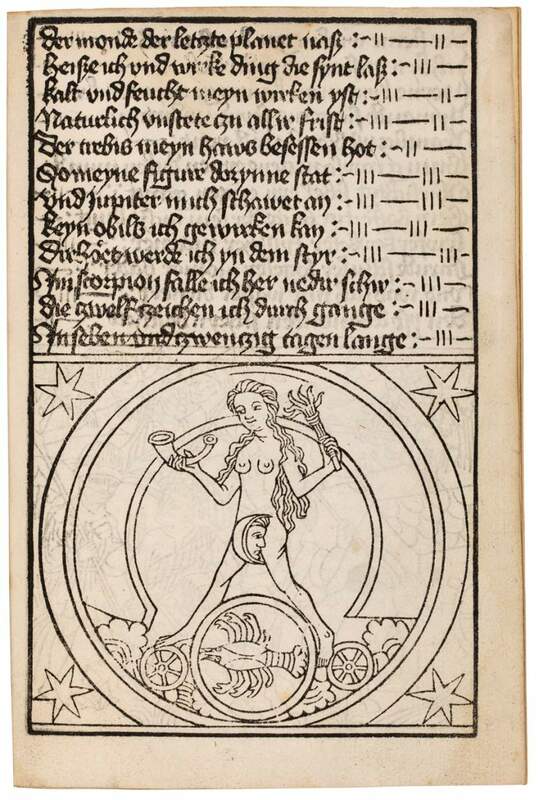 The woodcut of the Children of Venus (f. 5v) includes a banner with the arms of Basel, which is thus very likely this edition's place of origin. This is thought to be the first blockbook edition of ‘the planets and their children’. Only one other copy printed from the same woodblocks is known, surviving merely as a fragment of four leaves kept in Heidelberg. The copy at hand is the unique copy of the second issue and the only complete copy of the first edition at all. It is thus subject to the provisions required by the German Kulturgutschutz.